Pep it up by adding Bell peppers, also known as sweet peppers, to your daily dishes. You probably have noticed by now that staple ingredients to most of my meals include peppers. If your thinking its for spice or heat, your wrong. Bell Peppers are not only good, but they are good for you. Peppers have way more going for them then their shape, size, and the hit of color they bring to dishes. Bell peppers are green, orange, yellow, and red. I always buy them fresh, but they also come frozen or canned. Some pack heat and others are sweet. Peppers are loaded with good nutrition and packed with excellent sources of vitamins A and C. They are low in calorie and contain potassium, folic acid, and pepper. Interestingly, red peppers are the most nutritious. 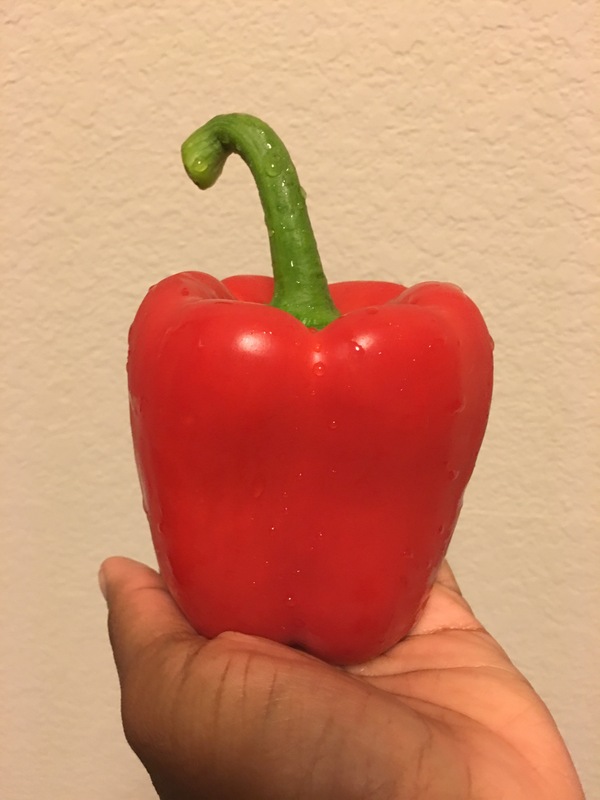 Compared to green peppers, the red ones have 10 times more beta-carotene and more Vitamin C. Green peppers harvest first before turning yellow, orange, and then red. Red peppers stay on the vine longer and for this reason they are the most nutritious of the bells. There are so many ways you can incorporate bell peppers into your diet. Bell peppers can be added raw to salads, veggie trays, stir-fries, and more. They can be roasted, grilled, and cooked into cuisines or pasta dishes. I personally love stuffing them. They can be stuffed with rice, quinoa, cous cous, beans, meats, and other combinations. Check out a previous post, Quinoa & Brown Rice Stuffed Peppers. Bell pepper contains an impressive list of plant nutrients that found to have disease preventing and health promoting properties. Unlike in other fellow chili peppers, it has very less calories and fats. 100 g provides just 31 calories. Fresh bell peppers, red or green, are rich source of vitamin-C. This vitamin is especially concentrated in red peppers at the highest levels. 100 g red pepper provides about 127.7 Âµg or about 213% of RDA of vitamin C. Vitamin-C is a potent water soluble antioxidant. Inside the human body, it is required for the collagen synthesis. Collagen is the main structural protein in the body required for maintaining the integrity of blood vessels, skin, organs, and bones. Regular consumption of foods rich in this vitamin helps the human body protect from scurvy; develop resistance against infectious agents (boosts immunity) and scavenge harmful, pro-inflammatory free radicals from the body. It also contains good levels of vitamin-A. 100 g of sweet pepper has 3131 IU or 101% of vitamin A. In addition, it contains anti-oxidant flavonoids such as a and ÃŸ carotenes, lutein, zea-xanthin, and cryptoxanthin. Together, these antioxidant substances in sweet peppers help to protect the body from injurious effects of free radicals generated during stress and disease conditions. I hope this inspires you to Pep it up!! !